Have you ever wondered what ancient civilizations looked like? Or where they were in comparison to where we live today? 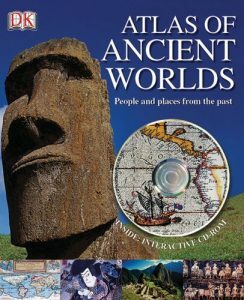 This unique atlas will take you on an incredible journey around the world and through time to explore the worlds of Egyptian pharaohs, Japanese dynasties, Peruvian peoples, and more. Experience a Mayan basketball game, climb the ziggurat steps at Chichén Itzá; and find out what happened behind formidable castle walls in the ancient Saxon countryside-all in the pages of the Atlas of Ancient Worlds.